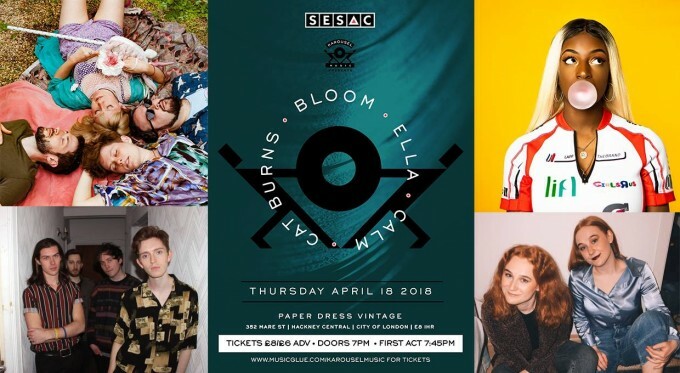 It’s the April installment of the Karousel Music x SESAC industry showcase! Brighton’s harmonic electro-pop darlings Bloom are in the midst of recording album two following widespread critical acclaim for the first – entirely DIY – record where remarkably they had no team to speak off beyond their loyal fans. Co-fronted by telepathic, harmonising best friends Emily and Megan – Bloom make electronic folk pop using big beats, layered vocals and shimmering synths. Having been picked as one of the acts of 2017 by Richer Sounds Richer Unsigned, and fresh off the back of a live Abbey Road session in February, the new record pushes their ability for deceptive time signatures and intricate melodies all weaved together by lyrics that make you feel you had some best friends out there you never knew about. Cat Burns is an 18 year-old singer/songwriter based in South London. The Brit School graduate released her first EP at just 15 years old independently and within the first 24 hours it charted at number 11 in the Singer/Songwriter charts. Cat returned in 2018 with her new single Sober. Originating from various parts of the UK and basing themselves in South London, CALM hit the internet in late 2018 with their debut track ‘VIVID’. Their sophomore single ‘WHAT YOU SAYING’ has received widespread acclaim and support from BBC Introducing, including plays on BBC Radio 6 Music. For lovers of early Verve, Longpigs, Stone Roses, EMF and Suede, this is absolutely for you. Ace new band. Empowering Pop Duo ELLA are identical twin sisters from Norway, singing upbeat catchy tunes you won’t be able to forget.